The Great Lakes hold 90% of North America's fresh surface water. But, this water supply is not unlimited. 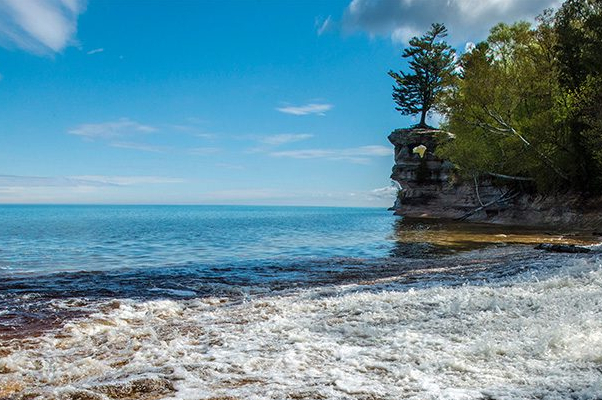 The Great Lakes hold nearly 20% of the world’s fresh surface water. And, more astonishingly, the Great Lakes hold more than 90% of North America’s fresh surface water. But, this water is not unlimited. It can be depleted if we don’t take care to keep Great Lakes water in the lakes. The Great Lakes–St. Lawrence River Basin Water Resources Compact was approved by all eight Great Lakes states, the U.S. Congress, and was signed into law by President George W. Bush in 2008. The Compact bans the diversion of Great Lakes water outside the basin, with limited exceptions. Only two situations allow a community located outside of the Great Lakes to apply for a diversion. Any community applying for a diversion must demonstrate that it has exhausted all available options for getting water. In other words, a diversion must be a last resort. Any diversion application must be approved by all eight Great Lakes states. The two Canadian provinces bordering the lakes are allowed to provide input as well. Any state may veto the diversion application. The Compact also required each Great Lakes state and province to set up water management programs to ensure the water we have is used wisely. The city of Waukesha, Wisconsin is located a few miles west of Milwaukee. Waukesha lies outside the Great Lakes basin but in a county that is partially in the basin. The city’s water supply is contaminated with radium, a naturally occurring carcinogen. In 2016, Waukesha applied for a diversion of water from Lake Michigan. The city’s application was the first test of the Great Lakes Compact. On June 21, 2016, the eight Great Lakes states voted to approve Waukesha’s diversion request with significant restrictions. Among the most important condition was a requirement that all water diverted from Lake Michigan to Waukesha must be returned. This results in a no net loss of water from the Great Lakes as required by the Compact. The vote to approve Waukesha’s diversion of water from Lake Michigan is not the end of the story. We are watching closely to make sure that the city of Waukesha and the State of Wisconsin honor the terms of the agreement. We expect that the Compact Council and its members will act promptly if Waukesha and Wisconsin do not meet every requirement imposed by the Council. And, if necessary, we will take action to compel compliance with the Compact Council’s requirements.